Harbortouch offers this exclusive Casio® small business cashier register for free with a merchant agreement. Accept all major credit card payment types with integration directly into the cash machine. Get approved and ships in 24 hours. We know not every business needs a touchscreen point of sale system when a cash register can get the job done. 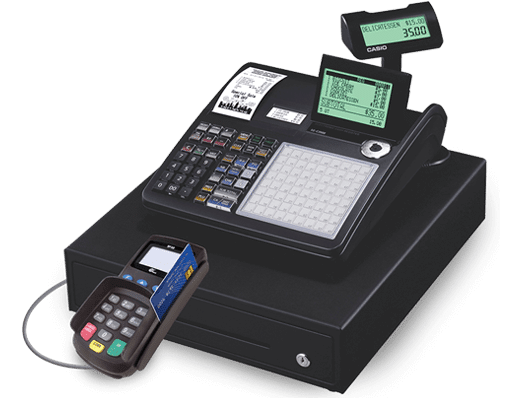 For that reason, Harbortouch has partnered with Casio to offer a free cashier register POS program with an integrated EMV credit card reader for even the most demanding retail and restaurant establishments. Each cash machine features a large display (LCD), backlit customer display, dozens of items/department keys, drop and load thermal printer and heavy duty cash drawer, making this the perfect solution for any restaurant, retail store, or small business. Most importantly, if your hardware breaks or malfunctions, Harbortouch will replace your register at no charge. 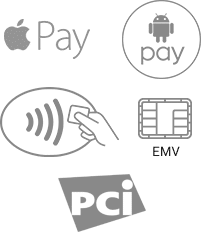 Your Casio ECR contains a secure and PCI compliant EMV credit card reader for payment processing to accept all credit card and debit card payment types. With direct credit card integration, you can track all of your credit card sales, cash sales, and checks directly from your cash register POS. Our Casio ECR isn’t some cheap cash machine; it’s the real deal. With an easy-to-use online keyboard layout wizard, you can customize your cashier machine’s software and keyboard layout to your requirements before you even receive your new equipment. So easy a kid could do it, the online keyboard layout wizard will save you lots of time instead of trying to program your new register software manually.